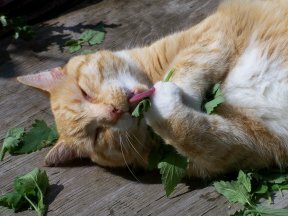 As we all know, many cats just can’t get enough of catnip — nepeta cataria, a fragrantly intoxicating plant native to Asia — although why it has such an effect on cats has remained a mystery. However, recent research may shed new light on the riddle — as well as identify a few other substances that may delight your cat even more. Cats react to catnip when they inhale the scent of nepetalactone, the active ingredient in nepeta cataria. It is a terpene, an aromatic compound in the same family as the chemicals that give marijuana its characteristic scent. The relationship between cats and catnip was identified in the 1940s, although it still remains unclear which genes cause cats to react so feverishly. Even more curious is that not all cats are susceptible to catnip. Some species of cats (big and small) aren’t affected at all, while others experience only mild effects. 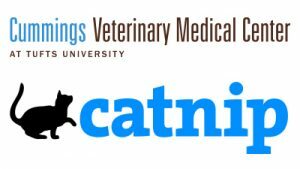 A new study conducted at UC Davis — and headed by Tony Buffington, DVM, PhD, DACVN — tested the effects of catnip on 100 cats to try to understand the connection once and for all. The team discovered some alternatives that had similar effects when imbibed by cats — silver vine, Tatarian honeysuckle and valerian root. In total, 80 percent of the feline test subjects responded to silver vine (a higher response rate than catnip, which got just under a 70 percent response), with valerian root and honeysuckle trailing with approximately 40 percent each. Some cats who didn’t react to the catnip did react to one of the other stimulants, and only 23 of the cats responded to all four plants (only six cats reacted to nothing at all). The majority of the cats responded to one, two or three of the plants with varying degrees of overlap. Caption for photo at top of page: There’s no mistaking the delightful response catnip elicits from most cats. But three other plants have been found to to be safe and intoxicating, as well.